The John Lennon Educational Tour Bus hits the road this fall to help keep music education strong in six of NAMM Foundation’s Best Communities for Music Education. The tour includes SupportMusic Forums and Lennon Bus residencies. During the residencies, students will have the opportunity to write, record, and produce original songs and music videos. The NAMM Foundation will host a SupportMusic Community Forum at each school inviting educators, NAMM members and community leaders to galvanize local support for music education. The NAMM Foundation invited schools named as 2015 Best Communities for Music Education, and recipients of the SupportMusic Merit Award, to submit a one-minute video. For a shot at a Lennon Bus residency, students creatively highlighted the strength of their music programs through the theme ‘What Makes Music Education Great in My School’. 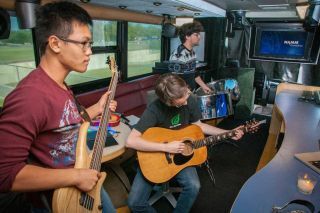 Students will spend the first day of the residency creating a music video project in the John Lennon Educational Tour Bus’ mobile recording studio. On day two, the NAMM Foundation will host a national SupportMusic Community Forum webcast that will share the successes and challenges of each school’s music education program. The forum will also present strategies to gather support for music education within a school or district’s core curriculum. NAMM member companies have donated instruments and equipment worth more than $3,500 per school including gear from Audio-Technica, Epiphone, Genelec, Mackie, Other World Computing (OWC), Neutrik, Yamaha and ZVEX Effects. The SupportMusic Community Forums and Lennon Bus residencies kick off this month in McKeesport, PA, with stops in Waxhaw, NC and in Miami, FL. The Spring tour resumes in February 2016.